The Oakland artist performs at MUTEK.SF. Russell E.L. Butler quit their 9-to-5 to pursue a music career last year. As with many artists in Oakland's underground music scene, Russell E.L. Butler's life took a major turn after 2016's Ghost Ship fire. They watched the warehouse erupt in flames that night with 17 of their friends inside. "If you were there, it's like your entire physiology changed," said Butler, who is gender non-binary and prefers gender-neutral pronouns. "I definitely felt that. Everything changed." At the time, the techno artist was about a month away from releasing an EP, I'm Dropping Out of Life. Conceptually, it represented a desire to pursue a career in music full-time instead of balancing it with a 9-to-5 job. Losing friends in the fire encouraged that dream and Butler's need to go for it. It felt like a responsibility. Plus, making music was the only therapy that worked in the aftermath. "I felt and still feel very lifted up by the people that I knew," they said, pausing to wipe their eyes. "This is difficult to say because I don't want to sound arrogant, but I feel like my work is a continuation of their work as well. The folks who did record music, I play it a lot in my sets. I try to embody the advice folks gave me, or the inspiration that I gained from them. "I knew this was my work," they continued. "It wasn't a side thing anymore." Butler was born in Bermuda, the tiny British island territory perhaps best known for its pink sand beaches. Despite growing up in paradise, Butler was fascinated with the legend of California — and Oakland in particular. They loved the hip-hop culture, especially the hyphy movement, and devoured stories about the Black Panthers and the city's history of resistance. They moved after finishing college nearly a decade ago. Music has been a constant since childhood. Butler started with violin at age 4, moving on to saxophone and guitar in school bands. There wasn't really any kind of music scene in Bermuda, Butler said, so they experimented solo. That set the tone for the rest of Butler's music trajectory. "I was playing music but I wasn't playing anything I wanted to be playing," they said. "I was very much alone in my room in the dark, imagining other people playing the parts and imagining a crowd." When they first moved to Oakland, Butler was in the throes of a black metal phase. Their death rock project, Black Jeans, eventually fizzled, but Butler had already garnered an interest in techno at that point. (They didn't think they liked techno, but some dark wave parties changed their mind.) Techno, crafted on a modular synthesizer, became the focus in 2012 — a natural extension of their hybrid scientific-and-creative brain that is at once rule-oriented and passionate. Butler has wrestled with bringing those two sides together for a long time, in part because of the way they were raised in Bermuda. "If you're Black and you've reached a certain social level, it's a very tenuous thing," they said. "I feel like there's this awareness from Black parents to ensure the next generation you're building up is going to be better off." While Butler's parents and other family members all loved music, their creativity was always separate from their profession. Butler felt that familial and cultural pressure to build a more traditional career, but as an immigrant, they also needed a steady job to keep them in the United States. That eventually changed when they got married, and soon, the idea behind I'm Dropping Out of Life could be a real-life option. Butler's next release will be their debut full-length, The Home I'd Build for Myself and All of My Friends, set to drop in July via San Francisco label Left Hand Path. Nine of the 10 tracks were made almost immediately after the Ghost Ship fire, which can be felt in a weighty, haziness that inhabits the sound. Conceptually, it's full of idealism while simultaneously rejecting effort to create a utopia. "I think if anything it's caused more problems in this world than anything else. I think something that is more effective is people setting out ideals and trying to their best. So, this is kind of a sonic blueprint of an idealistic space for literally me and all my friends, me and my community," they said. "One of the goals of late capitalism is to leave you with no time to dream. This is me building the foundation for how I hope to inspire people to dream." It promises to be Butler's most broad work to date. Some of it is fast and percussive. Some is slow and ambient. Some is traditional and melodic. Some is tuned to Butler's own ear. "I've had this lightweight, personal motivation to essentially decolonize Western experimental and electronic music," they said. "I feel like one of the ways of doing that is creating your own structures based on your own personal history, the history of whatever culture you're in, the cultural moment you're in, and what you imagine that to be in the future. "The kind of world I imagine, I will be very lucky if I experience it in my lifetime," they continued. "That doesn't mean I'm not going to try to move the needle a little bit." Butler has drawn on Bermudian sounds and culture in their work in the past, but the upcoming record does so even more. There's more Bermudian-inspired percussion and "this very guttural, grounded, very in-your-hips, in-your-belly, in-your-heart kind of feeling," Butler said. "The sound of the record is more raucous and colorful and spatial and I feel like that really encapsulates the human nature of the island, the dense spiritual nature," they said. Perhaps there's even more Bermuda in these songs because Butler's relationship with the island continues to evolve. Funerals brought Butler back frequently over the past two years, and since Bermuda's population is majority Black, they are always surrounded by people who look like them. "There's this feeling of calm," they said. "At the same time, I can't be open and free about me being queer, non-binary, and trans.... There's this dissonance that exists now because I've found a place where part of me belongs, but it's also a place that will never completely understand me." 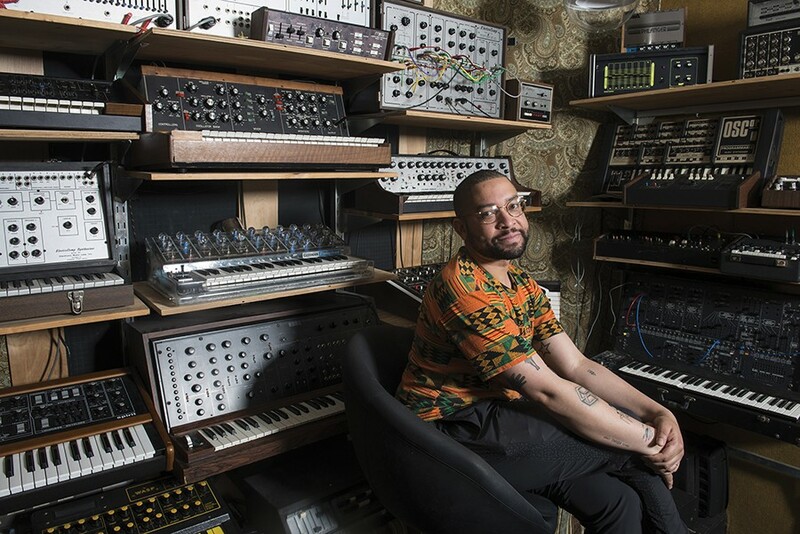 Russell E.L. Butler plays MUTEK.SF, the electronic music festival, on Saturday, May 5, at the San Francisco Mint, 88 5th St., San Francisco. Tickets at MUTEK.org.